Below is av 41 minute collection of video footage from the «Creatures of the Night Tour» in 1983 aka 10th Anniversary Tour. 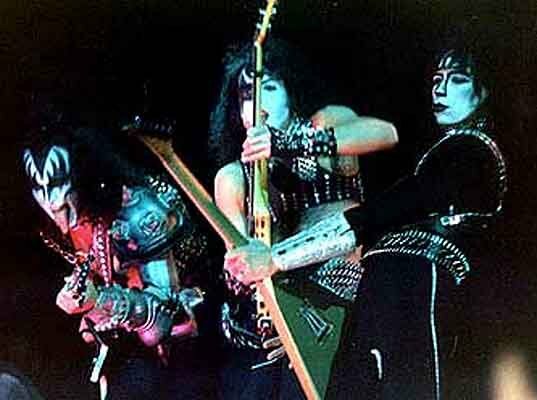 It was the second tour with drummer Eric Carr and the first tour with guitarist Vinnie Vincent, who replaced Ace Frehley. The dates in North America were abysmal, as very few people showed up at the shows on the tour. Paul Stanley recalled a show in Kentucky where he threw a pick that went over the entire audience of 2,500 and hit the floor. They later cancelled the rest of the US leg, and were offered some dates in Brazil, where they played to the biggest crowds of their career. The below footage is taken from the Brazil leg of the tour. This tour is the only tour to feature "Rock and Roll Hell" and "Keep Me Comin" performed live, although both would be dropped from the set almost immediately. When the tour ended, KISS decided to turn the page: Removing their make-up, and hanging up their platform boots until 1996.